Summary: The Florida Aquarium in Tampa received support from the Sea Turtle License Plate Grants Program to create an interactive, multimedia Sea Turtle Exhibit that will educate guests on the life cycle of loggerhead sea turtles and the role the public can play in promoting their recovery by protecting sea turtle nests and nesting sites. 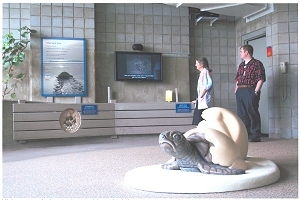 The exhibit, situated in the Beaches gallery near a recreated shoreline with live terns and sting rays, will include signage, a nest simulation, a video that depicts nesting and hatching behaviors, a egg shell simulation for young children and a life-sized adult carapace, either a simulation or a real loggerhead carapace. The exhibit will include a variety of features that appeal to and impact different learning styles, ensuring a broad impact for the educational messages.